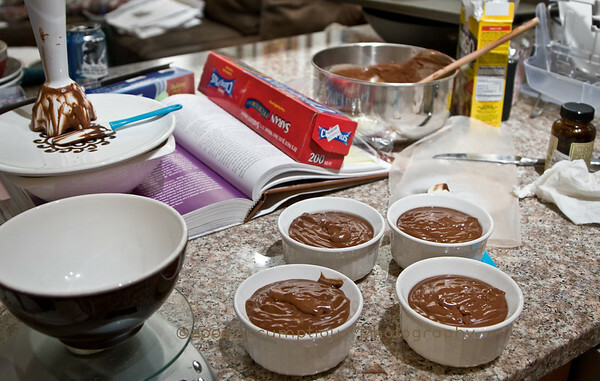 When I heard that Melissa of It's Melissa's Kitchen chose chocolate pudding for this week's TWD, I was kind of surprised. 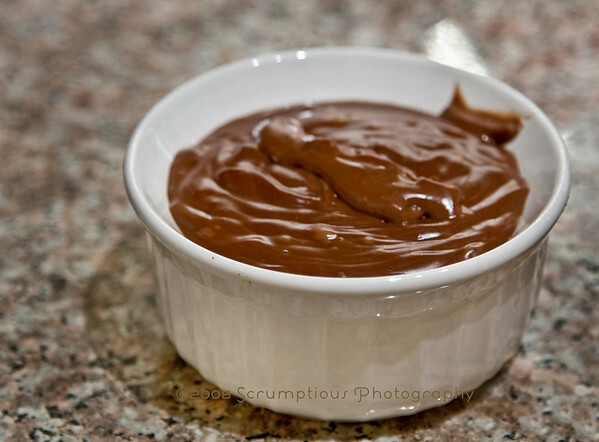 I always thought of chocolate pudding as kind of rubbery, not-very-chocolaty stuff that came out of powder from a box, and as such I was not a huge fan. Well, all of that changed after making this recipe. The texture turned out to be far from rubbery. It was so smooth and satiny, and it reminded me of a dense, rich mousse -- but even denser and richer. The dark chocolate in the recipe created a deep, delicious chocolate flavor. Dorie suggests throwing in some cacao nibs for crunch, but I love the velvety texture as-is. The pudding fit into four 6-oz. ramekins for chilling. (I'm still learning to get used to all of this waiting around for things to chill... I really just want to dive in, but I am starting to learn some restraint ;) ) Since I am anti-pudding skin, I covered them up in plastic wrap. I'm a total chocolate pudding convert now. My heart still belongs to tapioca, but I'll take this any day :) Don't forget to check out the chocolatiness at all of the other TWD blogs, and check out Dorie's recipe here! looks fantastic! i thought about using my stick blender, too, but went with the processor in the end. i'll definitely try the immersion blender next time! How lovely your pudding servings look. Just marvelous! I'm going to try the immersion blender next time! I noticed a lot of people opted for the blender instead...makes sense. Great shot of the one in the wine glass. i am going to use my immersion blender next time for less things to clean! yours looks awesome! I'm definitely going for the immersion blender. I was thinking I'd go the KA route-but you're on to something here. Thanks and your pudding looks so lovely. Oh good gravy, that looks perfect! I'm sold on the immersion blender now. It looks like you got more air into it than I did. Beautiful job! I was tempted to do a pudding-in-the-wine-glass shot, too (I have wine glasses similar to the one you used) - now I wish I had done it. Gorgeous shots! I have to agree with everyone else on the immersion blender. Looks so much easier than the processor and your pudding looks amazing! wow, look at that presentation! Absolutely delicious! I want some pudding right now! omg. 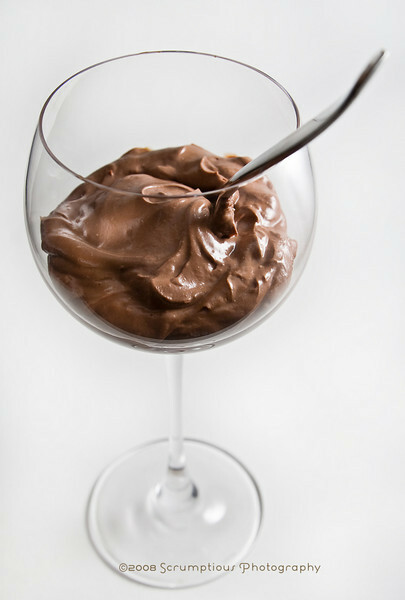 I am in love with your pudding in the wine glass picture. Darn you for always taking better pictures than me! HAHA. Great job! I think I'll have to try the immersion blender next time. Looks gorgeous! Who knew pudding could look so elegant? Your pictures are fabulous. Great job! oh my gosh kim those pictures SURE ARE scrumptious!!! that first one, i want to just dip my finger into the glass hehhee. this pudding was the bomb!!! wow - you could serve that pudding in a 5 star restaurant in a glass like that!! so beautifully done - again! I thought about using my stick blender but used the fp. Next time I will definitely use it! Great job your pudding looks lovely! The pictures are amazing. I'm glad everything worked so well for you and that you enjoyed it. An immersion blender sounds like the way to go! I never thought I would like pudding either. I'm probably crazy for saying this, but you are so brave for putting your book in the middle of all your ingredients and bowls. Your pudding looks wonderful! The photos are really amazing! You made brown look great! great idea on the immersion blender. your pictures are fabulous! such lovely pudding photos! and now, i really want something chocolatey. Gorgeous photos! My camera (I have a D50) was off being cleaned and I was dying using my moms point and shoot. Your photos make me jealous... and hungry! Nice job! I love your photos. An immersion blender seems to be the way to go -- guess I'm going to have to get my hands on one somehow. Great idea with the immersion blender, I just used my whisk and it worked well too. Can't beat homemade pudding! That photo w. the wine glass is gorgeous! I'm also a tapioca fan, but I do love this recipe! Ooh! 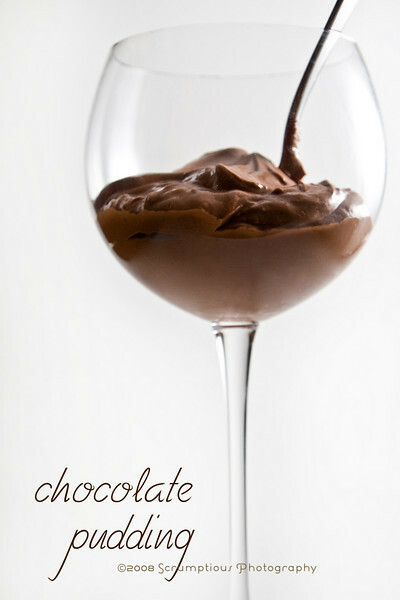 I really like the picture with the pudding in the glass! Mmmmm, love the pudding in the tall goblets. Very classy! I've just Stumbled Upon your site and I must say, your site lives up to its name - everything looks scrumptious! I love your process pictures! It's so nice to see the differences in how everyone works. 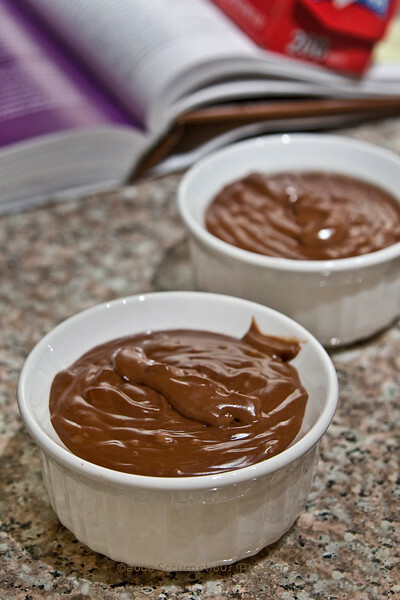 Your pudding looks smooth and chocolaty, glad to hear that you're a convert now! Your photos are wonderful and glad it all changed when you made this pudding. The box stuff does leave a lasting impression, do you remember the chocolate pudding you ate in the cafeteria at school? They always served that on a day they also had corn...? Anyhow, I am glad it turned out great for you and look forward to your post next week! Wow, your photos are amazing!! Your site is so beautiful!